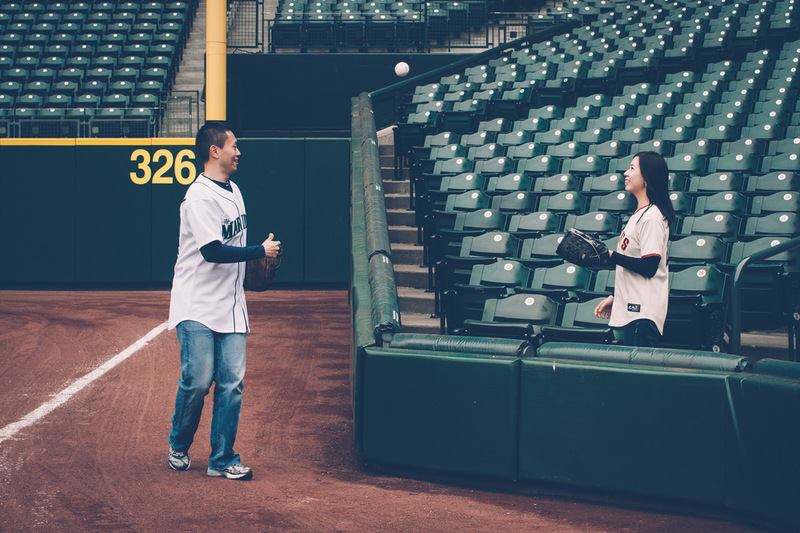 I met Matt in May of 2010 and we shared a love for baseball as we both grew up loving our teams (San Francisco Giants for me, Seattle Mariners for him). We remained friends the next 3 years as Matt supported me throughout the ups and downs of the Giants 2010 and 2012 World Series journeys! In early 2013, Matt saw a Facebook post that I was recently in Beijing for work and he was preparing for his own work trip to China and asked whether I have any tips to share. I suggested dinner and we started to spend more time together after he came back from his trip. I really enjoyed spending time with him to and we started dating in May and I've enjoyed every moment with Matt since then. In October of 2014, the Giants won their 3rd World Series in the last 5 years. Matt was by my side throughout the long playoff run and the amazing Game 7 victory. She was just a city girl, living in a Giants baseball world. She took the midnight train to Seattle. He was just a smaller town boy, living in a 1995 Mariners baseball world. He took the midnight train going anywhere to watch his team play. That opening was brought to you by Steve Perry and Journey (whom you Giants fans love to listen to when on another one of your playoff runs...but I digress). Everything Joyce said above is true, though there is one omission (more on that below). It was amazing the first time we ever met in person. How could it be that a girl could talk baseball ALL AFTERNOON??? It blew me away. The more time we spent together, more I fell in love with her and of course, found out about her. I found out that she loved the Washington Huskies (YES!!! ), her third baseball team is the Mariners (You don't say?!) and she was a Niners fan (OH NOOOOOOOO!!!!). Yes, I have a flaw (surprisingly) and that is I grew up in the Seattle area which means the Seahawks (Sea-Chickens to some...) were my football team. Even with the Hawks beating the Niners, Joyce found a way to be supportive and has even tolerated watching the game with me when the Seahawks' Super Bowl victory happenend...now that's love! Now if only the Mariners could win a World Series in an odd numbered year...I've conceded that the Giants will win again in 2016! After dinner at Ohana in Belltown, Matt was driving Joyce home when he made a stop at Green Lake Park. He suggested that they take a walk around the park so Joyce could practice for the Hot Chocolate Run 5K that she signed up for (she intended to do a mix of running/walking for this race) Joyce was wearing a dress and did not have walking shoes on but went along with it because it was such a clear and warm night in Seattle, which was rare for a January! There were stars in the sky and the moon was shining brightly. Matt took Joyce to the dock and surprised her by proposing with a beautiful ring in a LED lighted ring case. The ring shined brilliantly under the dark sky and she said YES!!! early to be seated before the ceremony starts. Thank you! Please join us for a hosted post-wedding brunch! The main airport in Maui is Kahului (OGG), which is approximately 11.5 miles (20 minutes) away from the venue. There are direct flights from west coast cities such as Seattle and San Francisco to Maui everyday. We've joined the Wedding Wings program offered by Hawaiian Airlines. This program extends a 5% discount to our guests for all mainland flights during the two weeks before, and two weeks following our wedding. Please follow these steps to book flights using the 5% discount code. We suggest staying by the Kihei/Lahaina areas for easier access to the wedding ceremony/reception (Kihei) and the post-wedding brunch (Lahaina). We recommend renting a car during your stay. We recommend looking at condo rental sites which might offer better rates if you are planning for a full-week stay. We recommend renting a unit that has Air Conditioning. This is a list of recommended hotels in the Lahaina area, please note that most hotels charge a daily rate for parking as well as a resort fee. We've also had success in the past with hotels using Priceline's Name Your Price tool /Hotwire but remember to factor in the parking/resort fees when bidding for hotels! We had so much fun on the one-day trip to Lanai that we definitely recommend others to check it out. Our boat took us to see dolphins near Lanai and we also snorkeled with a turtle there! We had some free time on the island and hiked to see the Sweetheart Rock there. Lanai is such a beautiful island and since it’s so close to Maui we would highly recommend doing a day trip there! We booked with Maui Adventures, there are also other companies that offer day trips to Lanai. There are different zipline companies that offer ziplines in Maui. Skyline Eco Adventures is a great choice and offers 2 different zipline locations in Maui. Road to Hana lets you explore the beautiful areas of Maui – it takes a full day so be prepared to allocate enough time to check out all the stops! There are so many beautiful snorkeling spots in Maui! We recommend checking out the list below and explore around the island! Maui has so many beautiful beaches. We recommend driving down the west coast of Maui and check out some of these beaches on the way down.